5th March 2018, Manila - The ICE Totally Gaming 2018 came to a satisfactory close on 8th Feb in London, UK, there are over 500 exhibitors participated this event and successfully attracted over 25,000 visitors in this year. It is offing substantial opportunities for manufacturers and operators to meet each other as well as establishing any business partnership. In 2016, n2-LIVE participated for the first time in ICE exhibition and this is the third year to take part of it. n2-LIVE got a roaring reputation every year. This year, n2-LIVE stand highlighted attractively bright-colored and energetic style, to stand out our innovative spirit and create an unforgettable experience to our guests. Instance, n2-LIVE platform have exhibited the new European live studio, the advanced user interface design and innovative betting system. Aside of this, there are more fun games with great prizes to keep everyone engaged and held in a warm atmosphere. Over years, n2-LIVE has been persistent. Dedicated and focused on providing products and services on online gaming business. Currently more than 100 well-known gaming operators in the world keep using our platform. Its services are provided throughout the entire world in order to provide comprehensive live dealer software. 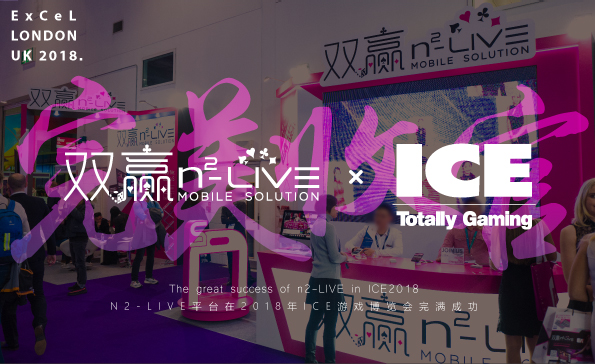 Through the ICE, n2-LIVE expects continue to cooperate with other countries, to unlock the infinite business opportunities. Limelight is the official reseller of EntwineTech Live Dealer software, you are always welcome to contact us for product information.